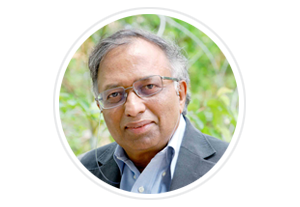 Dr Vijay Bhatkar is one of the most acclaimed scientists and IT leaders of India. He is best known as the architect of India's first supercomputer and as the founder Executive Director of C-DAC, India's national initiative in supercomputing. He is credited with the creation of several national institutions, notably amongst them being C-DAC, ER&DC, IIITM-K, I2IT, ETH Research Lab, MKCL and India International Multiversity. He has been a Member of Scientific Advisory Committee to Cabinet of Govt of India, Governing Council Member of CSIR, India and eGovernace Committee Chairman of Governments of Maharashtra and Goa. A Fellow of IEEE, ACM, CSI,INAE and leading scientific, engineering and professional societies of India, he has been honored with Padmashri and Maharashtra Bhushan awards. Other recognitions include Saint Dnyaneshwar World Peace Prize, Lokmanya Tilak Award , HK Firodia and Dataquest Lifetime Achievement Awards, and many others. He was a nominee for Petersburg Prize and is a Distinguished Alumni of IIT,Delhi. He is presently the Chancellor of India International Multiversity, Chairman of ETH Research Lab, Chief Mentor of I2IT, and National President of Vijnan Bharati.